The pacific islands of Fiji may seem a world away from the battlefields of Iraq, but the country is a hunting ground to fill vacancies with private security companies. 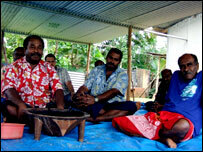 In Burera village Fijian men prepare a bowl of kava, the local narcotic drink. "Ai tei vovo, tei vovo. E ya, e ya, e ya, e ya," they chant softly. "Make ready, make ready. Your defence is just waiting to crumble." These are the words used by the Bati warrior caste to prepare for battle. Fijians have a strong military tradition based on their Bati warrior culture. The British army alone employs 2,000. Around 600 Fijians are on active duty for the United Nations, with Fijian soldiers protecting the UN building in Baghdad. After the coup in Fiji in December, the British army and the UN suspended recruitment in the country. However, private security companies operating in Iraq are still recruiting. Leone Matai is a Bati man. As they pass round a coconut shell filled with the grey liquid, he says: "Bati refers to the teeth - it bites." There are Batis in every tribe throughout Fiji. Their role is to protect the chief. "If you are Bati, the genes will come through you," says Matai. "If you are on the street, you will become a street fighter. If in warfare, you will be the best warrior ever. That's your destination." The consequences of such a reputation are visible up the road from Burera. 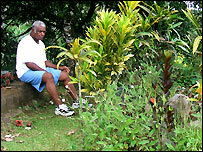 In a palm-ringed garden, a father stands next to two graves, those of his wife and his son. Manasa Lalaqila, who lost his 34-year-old son Timocei in Iraq in 2005, recalls the day he heard the news: "An officer came one morning. I was here alone and they tried to tell me what had happened. I found it very hard to accept. "I was told that my son was flying in a helicopter escorting some officers and insurgents shot them. They managed to collect his body and send it back to Fiji." Timocei is one of 20 Fijians who have died in Iraq. Lalaqila says his other son is on his way to Iraq. In a country where the average salary is £2,000 ($3,870) a year, the chance to work abroad can change your future. 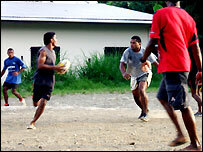 As the sun sets on a suburb of Suva, a group of men play rugby. Among them is a middle-aged, well-built man, Jo. He was working as a sugar cane farmer for £50 a month before signing up to go to Iraq with an American security company. "We thought we would be paid £3,000 a month because we were doing a very hard job," Jo says. He was a security guard for state witnesses in Saddam Hussein's trial. He escorted them to their villages in the "red zones" of Samarra, Ramadi and Basra without an armoured truck or bullet-proof vest. He was paid just £600 a month. He says the contract he had seen in Fiji was different to the one he signed in Iraq. Colonel Jonetani Kaukimoce is an agent for British, security company Control Risks. Pinned on his office wall is a waiting list of 150 men ready and willing to go to Iraq. Colonel Kaukimoce says he doesn't even need to advertise: "They come here just by word of mouth," he says. So far he has sent 150 men to Iraq, of whom two have died. His company pays £87,000 compensation if someone is killed or permanently disabled, but the family of these two men did not receive anything. "They jumped ship to another company and they became escorts," he says. "They were ambushed and killed. I received the bodies here because I was the last person to help them out. I talked to their wives and said: 'This is the body of your husband, nothing else, we don't have any compensation'." When asked if he worries that Fijians may be being exploited, he seems surprised. "The word exploited is not the right word," he replies. "I don't think that is being done to Fijians." 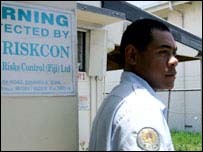 Most Fijian fatalities have occurred with private security companies. Yet, like many, Jo is willing to take the risk again, believing the next company will treat him better. "My next move is to go to Afghanistan, to Kabul with a security company," he says. "I'll be paid in English pounds - £90 a month. Is that good?" When Jo finds out what £90 equates to in Fijian dollars he seems embarrassed but not deterred. While options remain so limited at home, Fijians like Jo will continue to take on dangerous and underpaid work in wars on the other side of the world.